My room in the hotel had a phone on the wall. That evening I phoned my girlfriend Lynda back in Canada. I felt badly because I knew that she would be wondering why I hadn’t called her yet. She would think that it was because I couldn’t be bothered. Of course, this was not the case. I picked up the phone and got the front desk. Front desk made the whole thing simple, getting the international operator for me. Seconds later I was talking to Lynda. She sounded a bit hurt, wondering why I hadn’t called days earlier. I explained the difficulty figuring out the phones in France and she told me that she understood. The next day I set out for the Institut d’Etudes Françaises pour Etudiants Etrangers. I knew generally what direction it was in. I had this naive notion that I could find my way anywhere. Such is the case in North America where cities and towns are typically laid out in grids, but this is not necessarily so in other countries. I took streets I had not yet taken, turned onto others when I felt it was time, and somehow miraculously found my way to the school. Later I found out how the city is actually laid out and it’s a wonder I made it there at all. I found out from the Institute’s office that I could not be issued a student card until I paid my tuition fees. However, I could not do this until my bank draft came through, which I didn’t think would happen until the following week. Without a student card I wouldn’t be able to use the housing registry. This meant I might have to stay in hotels until I ran out of the money I had on hand. I had a credit card but I hadn’t tried to use it yet and wasn’t sure if it would work for me in France. Also I wondered how would I pay it off in France. So I didn’t want to use it. But the school did let me write a test to see what level I would study at. Everybody had to write the same test. If you got zero you were put in Niveau I, at the bottom, in class AA. Top students who already spoke French quite fluently were placed in one class all together in Niveau III. We had one hour to write the test. I went through it and understood very little. I didn’t even understand most of the instructions. I guessed at most of it. Frustrated, I eventually just translated a bunch of words I knew and wrote a note saying I was just doing that to prove that I did know something! Then I handed it in. They placed me in Niveau I, but four classes from the bottom, in class D. So I wasn’t the worst who wrote the test. And it turned out that this was about the best class I could ever have been placed in, based on the quality of the other students. It was just a great collection of people, many of whom became good friends. I made an appointment to see the housing registrar even though I knew that she probably wouldn’t see me without a student card. Someone had told me that the housing registrar could be rather difficult. The appointment was for the next day around ten. I arrived a few minutes early. I needn’t have worried about being late. When you walked through the school’s arch, took the left up the stairs to the second level, you arrived at a common area around which were spread hallways, offices, and rooms. In this common area sat a curious woman behind a long desk. You had to deal with her before you dealt with anyone else. Somewhere in her fifties, I would guess, she always dressed like she was a lot skinnier and younger than she actually was. She spoke French fluently but with a broad accent. At first I assumed she was French and just happened to speak English well. Later I found out that she was actually British but had lived in France for a quarter century. As the year progressed I eventually was able to tell for myself that her accent was too broad to be truly French. When I arrived for my appointment I immediately informed her of my presence. She brusquely told me to take a seat and wait. I noticed that a lot of other students were already sitting around waiting. I told her the time of my appointment, thinking that perhaps it meant something. She told me rather harshly that she didn’t give a hoot about that and would I just sit down. I decided that she was a bit of a dragon lady. Subsequent encounters proved me correct, though eventually I discovered that dragon ladies can be people too. So I sat and waited. Forty-five minutes later I was still waiting when a young man with long black hair approached me. “You speak English,” he said, in a British accent. I agreed that I did. He introduced himself as Mark, from England. He was looking for a place to stay as well. It turned out that his appointment was right before mine. He finally got to go in to see the registrar. When he came out he told me that she had told him of a place where two rooms were available. He asked me if I would like to come along. The registrar popped her head out and said that this wouldn’t bother her any if I did. I immediately agreed, knowing that she probably wouldn’t have spoken to me anyway without my student card. Lucky. Mark was twenty-one and had just finished university in Wales. His father, the CEO of an extermination company, had allowed his older brother to flake out for a year in Spain after university, so Mark insisted that he be allowed to do the same in France before having to find a job. I’m not sure Mark learned much French in Aix, but I do believe he had a good time. Mark turned out to be a good guy and a lot of fun. The apartment was a twenty minute walk north out of town, up a huge hill. Mark, a smoker, huffed and puffed his way up. He commented a couple of times that he couldn’t believe the hill, which was quite steep in places. You would be hard pressed to bike up it, but at one point it affords a great view of the city. A man of about sixty, Monsieur Richaud, stood by the road waiting for us. The addresses could be hard to figure out so this was a good thing. He greeted us and took us through the parking lot to the condominium. There were four bedrooms with a central kitchen. Two students were already living there, Americans. At least two of the bedrooms were actually converted living rooms. Madame and Monsieur Richaud were staying in one of the rooms not yet rented out. They barely spoke English. He was French and she was German. As neither Mark nor I spoke either French or German we had to make do with the Richaud’s English. The apartment was clean and tidy. We snapped it up right away. I was quite relieved to have one major worry resolved. The Richauds wanted money right away, so Mark and I went downtown where I discovered that my credit card worked after all. Mark had already borrowed something like four thousand francs from another student he had just met who later became a good friend of mine, a Scottish girl named Tracey Coleman. We went back and signed the lease, and moved in the next day. One of the available rooms, the smallest, had a shower. The monthly rent was the least for this room, 1850 francs. (The other rooms all cost more.) 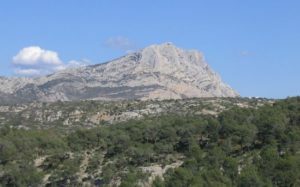 The other available room was slightly bigger, faced east, and had a fantastic view of Mount Sainte-Victoire, made famous in a painting by Paul Cézanne, whose workshop turned out to be right next door (I always intended to visit the workshop but never actually got around to it). I took the smaller room with the shower, a decision I never regretted. The communal shower sucked. Apparently you had to crouch to use it, although I never tried it. Mark was happy with his room because it was bigger and had a little balcony. And there were lots of pieces of furniture upon which he could place his empty beer and wine bottles. My worries seemed to be dissolving, one by one. I knew my credit card worked, so I had cash for the forseeable future. I now had a roof over my head, or at least I would the next day, after I moved in. I was starting to feel good. That night I had supper with Mark, a young Swedish girl still in her teens whose name I don’t recall, and an American girl named Kristin, around twenty, who also became a friend of mine. We were all attending the Institute. We sat at outside at a table on the Cours Mirabeau. I was relaxed, extraordinarily happy to be in Aix rather than working back in Canada. Although early October, it was still quite warm in Aix. We talked about who we were and what we were doing there. It was such a great atmosphere. At twenty-eight I was by far the oldest at the table, but I didn’t feel old. Or rather, I didn’t feel bad being old. I felt more experienced than the others, is all. Although in truth I was probably the least experienced of the bunch, at least when it came to travelling.